Shipped quickly. Item as described. Item still not recieved and no response from seller. Great bike rack for the price. I needed a bike rack to haul one bike on occasion, like 2-3 times a year. THis was exactly what I was looking for. It uses hard plastic blocks to hold your bike on the two metal rails so its a little hard on your finish unless you add some protective rubber. Aside from that, it's exactly like the $50-$100 racks. 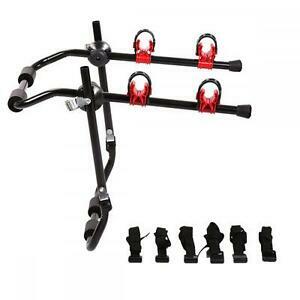 The bike rack is typical of Chinese quality. Not very good. Trying to tighten the screws that hold the section one puts the bike in was frustrating as the screws themselves are a very cheap alloy, and the heads stripped as soon as pressure was applied. Putting it together was easy and fast. The price was right. It does hold my bike securely even though the screws stripped. I would give it a C-. Not made for today's style of bikes. This bike rack appears to have been designed for the older bikes with a straight top bar. Unlike today's bikes, they have thicker and/or top bar in a diagonal hence won't fit in the red brackets. If u have a beach cruiser don't even try it. However, I am using it on an older car, i removed the red brackets, mounted the bikes, and used a strap to tighten/secure along the cars fenders. It was bigger than I expected and it was a little too big for my road bike (have to squeeze the bars to fit). Over all it was easy to put together and arrived on time.